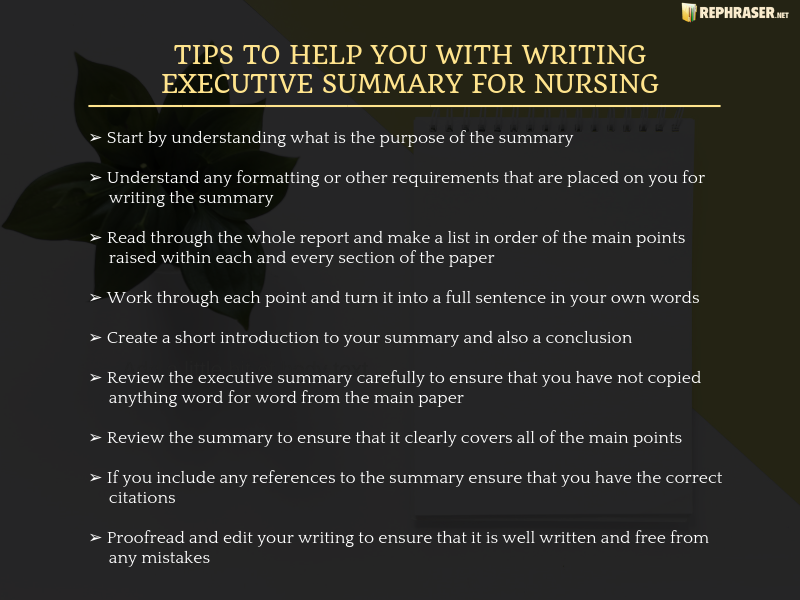 Why Is an Executive Summary for Nursing Important? 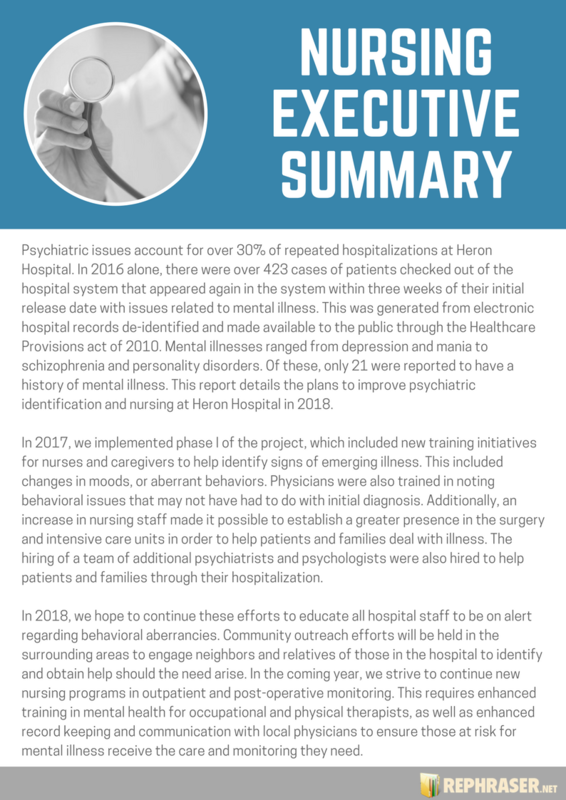 A nursing executive summary will appear at the front of a much larger report. Its purpose is to inform the reader of exactly what the whole report is about in a high enough level of detail for them to know exactly what is being covered. In general, an executive summary will contain far more detail than you would include within an abstract. Writing an executive summary in nursing education can be a difficult and lengthy process. It will need to also be correctly formatted and completed following the specific instructions for the paper you are writing or have been asked to write the summary for. Because of the difficulties involved, it can be necessary to seek out professional help of a summary rewriter if you want to ensure that you get it done perfectly. Liked our samples? Don’t wait up and place an order to get your own executive summary now and enjoy all the benefits of our service! 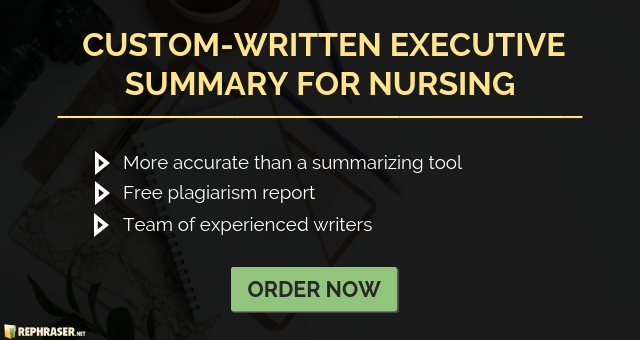 How Should Your Nursing Executive Summary Be Structured? 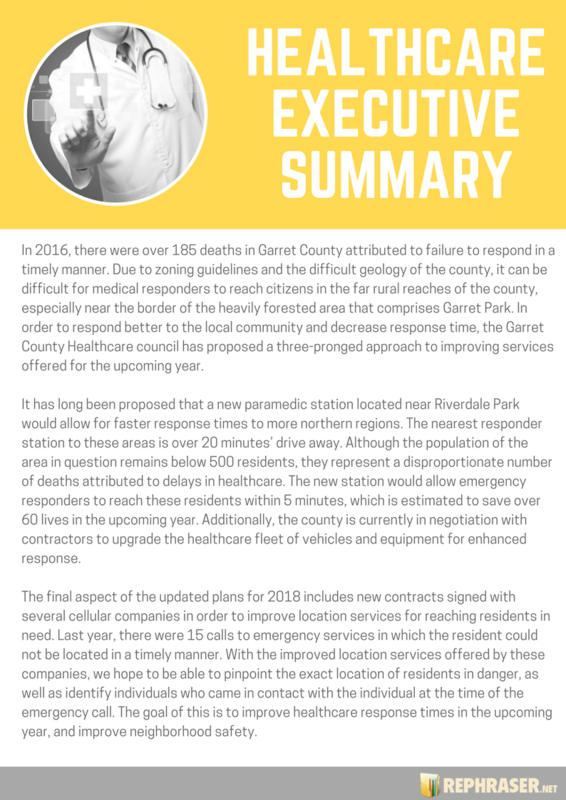 If you look at any healthcare executive summary example you will see that the structure and order of the summary will closely follow that of the main report. In general, you will follow the specific order of the paper that you are summarizing. So the order of your nursing school executive summary will very much depend on the type of paper that you are required to summarize. Nursing school: Learning to save lives whilst trying not to take your own. Before you start it is often best to go look at a nursing executive summary example written on a paper similar to your own. 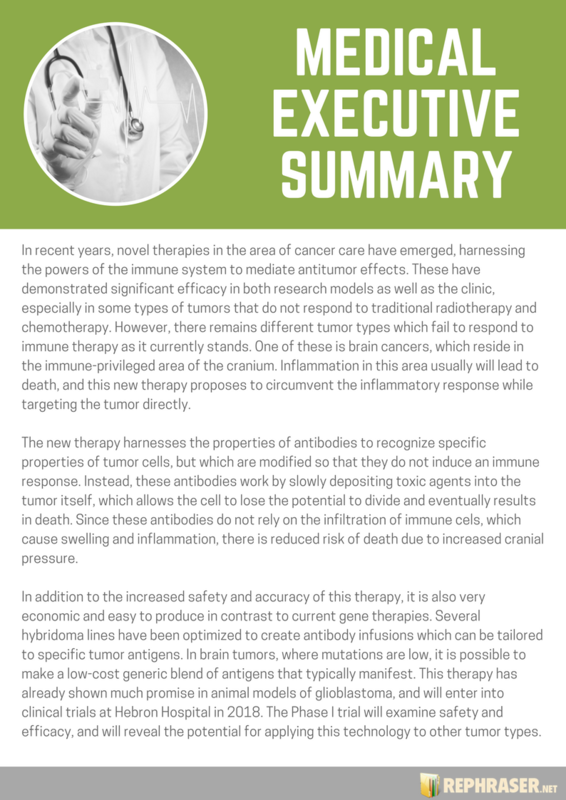 A good medical executive summary example will help you to better understand just what is expected of you and the level of detail that you will be expected to reach within your writing. Of course, you cannot simply copy any example that you look at as it simply would not summarize the paper you are tasked with. Start by understanding what is the purpose of the summary: is it purely to summarize the paper in detail or is it to get the attention of the reader and make them want to implement a proposal. The tone and focus of your writing will be different for each so it is important you know who the audience will be. Understand any formatting or other requirements that are placed on you for writing the summary. These should be followed perfectly. Read through the whole report and make a list in order of the main points raised within each and every section of the paper. Keep your notes in your own words as you will not want to repeat the wording from the main paper. Work through each point and turn it into a full sentence in your own words. Add additional sentences and transitions so that the writing flows in a logical manner for the reader. Create a short introduction to your summary and also a conclusion. Review the executive summary carefully to ensure that you have not copied anything word for word from the main paper. Your summary must be completely unique and free of any form of plagiarism. If you have reused any of the original text it should be changed so that it is unique. Review the summary to ensure that it clearly covers all of the main points that were raised within the paper and that it fulfills the purpose of your writing. If you include any references to the summary ensure that you have the correct citations in the right format for your paper. Proofread and edit your writing to ensure that it is well written and free from any mistakes. Simple mistakes in your summary suggest a lack of care and it will cast doubt on the content of your paper. A well-written summary can ensure that the reader will fully understand what your paper is about. It can also aid in ensuring that people will take action based on any recommendations or proposals that you are making. Not everyone is skilled at summarizing and creating an executive summary of a lengthy report can be a highly time-consuming exercise. This is why many will want to seek out support with their summary from our specialized services. We have been providing students and others with support with summarizing and paraphrasing for many years and can provide you with an expert that will fully understand your original paper and how your summary should be written. All writing in excellent English: our experts have native level English language skills and are able to write in perfect academic English to the standard required of your paper. Perfect formatting: our experts fully understand the different styles of academic formatting that are required for the writing of this type. Plagiarism free writing: our experts take extreme pride in ensuring that their work is always unique and free from any copying. We also provide you with a free plagiarism report on every piece of work. Error-free: not only do we use highly trained and experienced experts to deliver our work we also provide you with free proofreading on all writing and editing. Unlimited revisions: if you want any changes doing to the executive summary then our experts will work with you until you are fully satisfied with the results. Delivered on time: we know that often the tasks that we are asked to help with are time sensitive. We will always turn your work around quickly and deliver within the agreed deadline. Guaranteed satisfaction: we will always work with you to solve any issues that you may have. If however, we are unable to fully satisfy you with our executive summary support then you will be provided a refund. Ensure that your nursing executive summary is finished perfectly by working with our fully qualified experts.